The AT Info truck is packed and on its way to downtown Chicago for Pack Expo International. The 4 day exhibition runs Oct 4-7, 2018 at McCormick Place. Visit AT Info in the South Hall at S-3300. This year the theme of AT Info booth demonstrations is Integration Nation. We’re spotlighting the simplicity of integrating Markoprint® coding technology onto a wide variety of packaging machinery. From label applicators, to thermoformers, to bag sealers, to egg packers, to high-speed feeders, to conveyor lines and more, Markoprint® is the best value industrial inkjet coder money can buy. In addition to our rugged and versatile coders, what separates AT Info from other solution providers is the expanded inks program. Solvent Ink portfolio ~ An extensive array of solvent ink options, including basic Black, as well as Red, Blue, Yellow, Green, White, the exciting new Light Blue, and others. HP Smart Card ~ HP Smart Card printers and ink cartridges set equipment parameters, identify the ink remaining in cartridges, and much more. Bulk Ink alternatives ~ A variety of bulk ink options is available, including Smart Card Black, hot-swappable Black, and now solvent bulk ink. 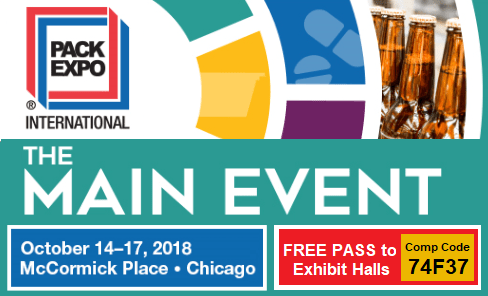 PACK EXPO International will attract 50,000 attendees, including C-level executives, engineers, plant managers, research and development, brand and marketing managers, quality controllers, specifiers, purchasers and packaging designers from a wide variety of prominent consumer packaged goods companies (CPGs) and retailers.